I’m planning to write a few posts on how I got to where I am now regarding pens, ink and paper in the coming weeks. However, one issue I planned to dwell on really deserves a post on its own. I learned how to write with a fountain pen in my school years in the 1970’s, but I gave up using them in the early 1980’s in favour or rollerball pens. I still have an old Osmiroid Calligraphy set with a copyright notice 1981 (must ink that up one day) but the fountain pen I had for daily writing use around that period is nowhere to be found. I can’t remember exactly what pen it was, but it was probably the cheapest Parker fountain pen that money could buy at the time. 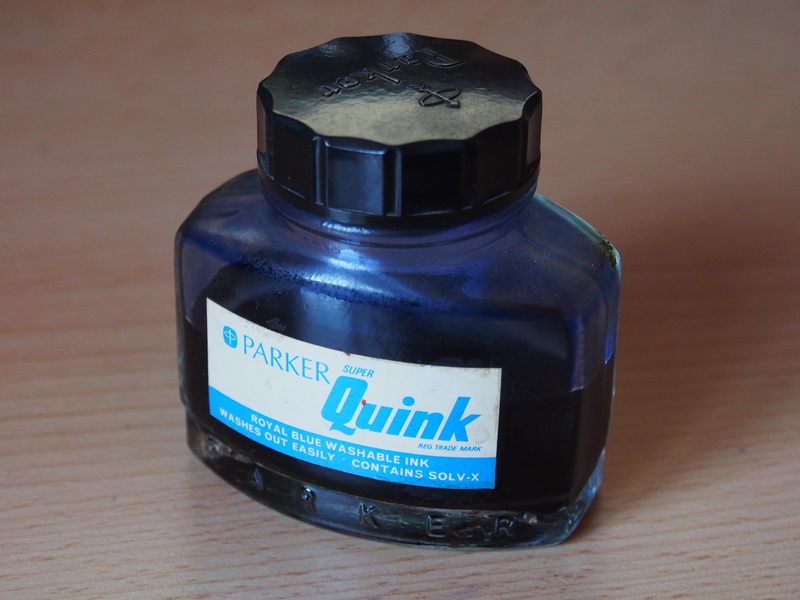 However, what I do still have is a bottle of Parker Quink Royal Blue Washable Ink dating from that period which contains the faintly sinister sounding “Solv-X”. 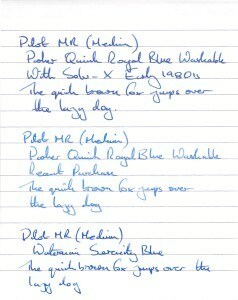 Parker ink was pretty much all that I could get in those days, and the Royal Blue Washable ink exemplified why I stopped using fountain pens – the cheapo pen I had gave a broad line and the Parker ink a really insipid washed out appearance, that I can best describe as “school blue”. I like blue, but I hate “school blue”. The bottle has been sitting on my home office desk as long as I’ve had a desk, less than half full, but unused since I stopped using a fountain pen. I’ve never had the heart to throw it away, but even though I restarted using fountain pens over the last few years I haven’t been tempted to use that ink – until now. I even bought a new bottle of Washable Blue Quink recently, to see if it had improved over the years, but still hadn’t got around to using it – again until now. The new bottle does not refer to the mysterious “Solv-X” – whether it’s been phased out or not I do not know. The image was scanned using a Fujitsu ScanSnap S1300i at 1200dpi. The scan isn’t completely accurate to my satisfaction (all three inks come out to be slightly more saturated than in reality) but it does show the differences between the inks. I also tried with an Epson Perfection 3170 scanner, but the scan was so saturated as to give a completely false impression of all the inks. I need to work on my scans though. The new Quink is exactly what I remember “school blue” to be – pale and washed out. It didn’t flow very well and felt dry. 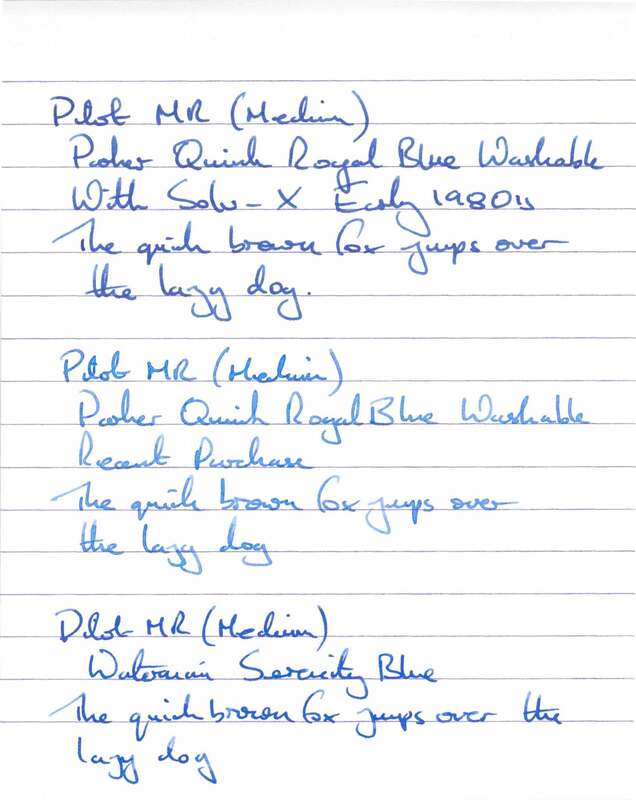 I dislike it as much as I ever did.The Waterman Serenity Blue smelt very similar to the new Quink, but apart from both being blue the similarities end there. The Serenity Blue flowed well and was moderately saturated. It would not be the end of the world if Serenity Blue was the only blue ink available – but I could not say the same about the new Quink. The old Quink was a surprise – it was more saturated, flowed well and was pleasant to write with. It gave off a very strong smeel, different from the new Quink and Waterman Serenity. The smell lingered for a few hours after drying – is this the mysterious “Solv-X” – and have I done irreparable harm to my nostrils? On drying the old Quink also had a faint blue/black (or maybe indigo?) tone to it, which doesn’t come over in the scan. I would also be happy if this was the only blue ink I could use (although it wouldn’t last very long). I could get used to the smell. However, something has clearly happened in the 25-30 years since the bottle was bought. Possibly it has reacted with the air over time, or sunlight has had an effect, or there has been some water loss if the bottle isn’t completely airtight. That’s all speculation. It has made me wonder though how my other inks will change over time, and whether there is much point in buying old, out of production inks. How closely would they look like they did when they were first manufactured? In this case the ageing process has been a good thing – but would that always be the case?